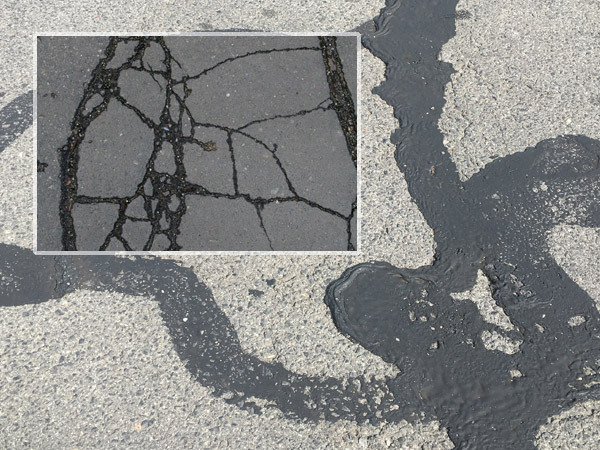 Commercial Asphalt parking lots faced with high amounts of traffic are often susceptible to alligator cracking, and as pavement continues to handle loads of high traffic the development of cracks and irregularities start to reveal themselves amongst wheel paths. An example of alligator cracking in asphalt-paved parking lot. You can tell if a fissure is an alligator crack by looking at the connectedness of the splits; severity can be diagnosed by visually inspecting the cracks; in the early stages cracks will be close together (roughly 1-foot apart) but as these cracks face heavy loads and high volumes of traffic the breaks in the pavement will increase in size and distance spreading to the surrounding areas of the lot. It’s important to resolve alligator cracking promptly and immediately as the issue can spread and start to cover a larger surface area of the lot or driveway and as the cracks split the issues become more costly and time consuming to fix. 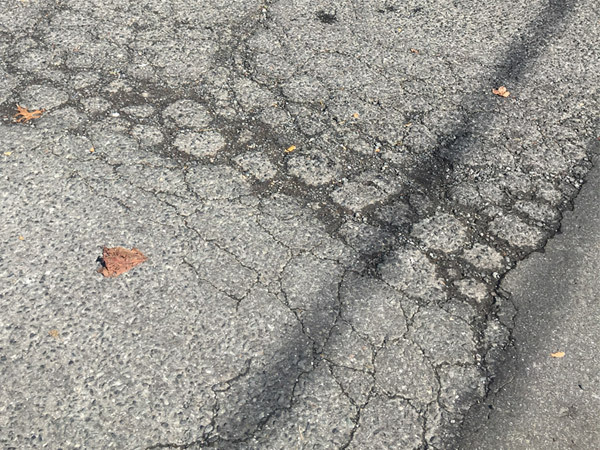 Examples of bad asphalt crack-filling jobs. The above pictures show a complete waste of money crackfilling. There is no ROI by doing this. Call (973) 458-1188 now for a free consultation, or contact us by email. At HOLES we are professionally trained to diagnose and repair any severity of alligator cracking ranging from Mill and Pave or full depth removal of asphalt and reinstalling proper base., we also offer a preventive maintenance service that tackles any problems that arise early on as not to let the integrity of the lot come into question. We encourage you not to ignore these issues, especially in winter and high precipitation months as water and run off are the largest causes of issues such as these, and will only make the fixes more costly. Any of these issues can contribute to alligator cracking and when combined can offer serious issues. As a professional construction company that specializes in asphalt and concrete repairs we will be able to identify the alligator cracking onsite. Have a HOLES consultant visit you and give you proper advice for your pavement areas. You will surprised our advice will most likely save you money and get the highest ROI.